Please book ahead if you would like to come to the Château. From May to September, Monday to Friday: 11am tour, 11.30am tasting. Please book in advance, and places are limited. A guided tour, in English, of the vines and the winery at 11am will be followed by a tasting of 6 wines at 11.30am. The tour and tasting costs €15 per person and the tasting only, without the tour, is €10. Well behaved children for €5 for the tour (then water not wine, we’d suggest). Allow an hour and a half for the whole package, and you are welcome to buy some wine at the end of the tasting. For ideas on where to eat, see below. Note that there is an excellent market in Créon nearby every Wednesday morning from 8.30am, if you want to combine the trip. If you simply want to buy some wine, let us know ahead what time you'd like to come. Prices for our whites, red, rosé and sparkling wines range from €6.50 to €15 per bottle at the cellar door and for pre-orders from our Calais depot. For orders placed at the Château to be delivered in the UK (for example, if you're flown over with hand luggage only), prices will be at the sterling rates shown on this site because of higher duty in the UK, plus shipping and delivery. We are 15 miles SE of the city of Bordeaux, at the end of Rue Bauduc, Créon 33670. You should find this on Google Maps, GPS etc. Come down the tree-lined drive and go straight ahead, past the pond, and you can park down in the yard under or near the tree by the old van. The tasting room is on the right hand side. If we're not there, call or text us as above. We recommend a local restaurant in the main square in Créon, called La Table (tel. +33 5 56 42 98 40). La Table is open from 12 noon to 1.45pm, except Mondays, and for dinner. There's a sandwich bar next to La Table and a creperie, and a good café, nearby in the square. There's a new Bistro Regent off the roundabout opposite Carrefour (see below) and a modern restaurant and pizzeria called Le Cosy near the end of our road. If you're with kids, you may want to know there's a 'McDo' on the edge of the town near Carrefour. If you're heading to the famous wine village of St-Emilion or the fabulous city of Bordeaux, allow half an hour's drive, plus time to park up. If all you want is a snack, we have two excellent, large boulangeries (bakeries) within a mile of us and, if you're coming on a paid tour, above, you can stop on the way to us and pick up a delicious sandwich or salad and any soft drinks. We can put your purchases in our fridge when you arrive and, as we’ve put a couple of picnic tables by the vines, you can enjoy your sandwich with a glass of vino after the tour and the tasting. Places are limited and you must book ahead when you reserve your tour, and this is only an option in good, dry weather. (If it's raining on the day, you'll have to change your plan, such as to eat at a local restaurant or at a bakery.) Please note that we do not sell any food ourselves, or provide picnics. Le Fournil de Créon is near the end of our road, and is open from 7am to 8pm, 7 days a week. In the morning, you can choose from a selection of sandwich fillings and styles of bread. We also use Maison Catarino, not far away and with similar opening hours, and the sandwiches and salads are excellent. We recommend that you buy sandwiches before our 11am tour, not after, as they often sell out. 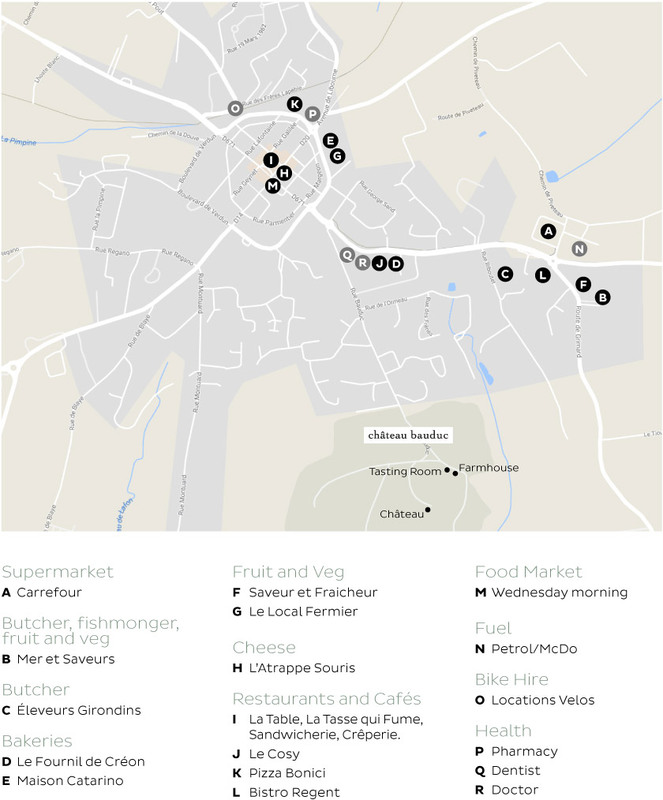 Here is a map of Créon showing these and other places of note, taken from our farmhouse guide, 'the local area'.